Looking for the latest in 2018 ATVs? Want to know all of the nitty-gritty specs, horsepower & torque performance figures, MSRP prices, model comparisons etc? 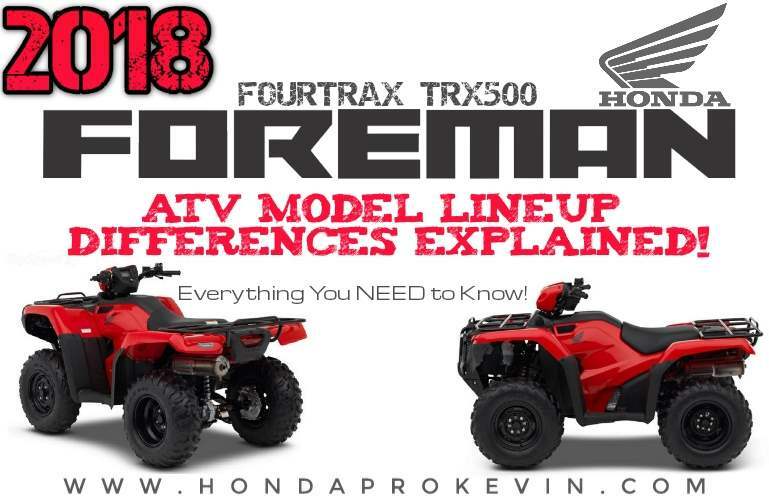 You’ve found the right place!Below I break down each of the Honda FourTrax four-wheeler models in individual reviews including everything from the smallest TRX90X kids model up to the biggest ATV model that Honda offers – the Rincon 680 and everything in between like the Recon 250, Rancher 420, Foreman 500 and Rubicon 500 models. Keep an eye on this page for individual 2018 ATV model reviews just like I did on the 2017 ATV model lineup that you can find here. I’ll be breaking down detailed horsepower and torque performance numbers, pricing, R&D info and loads more and they will be finished up shortly. 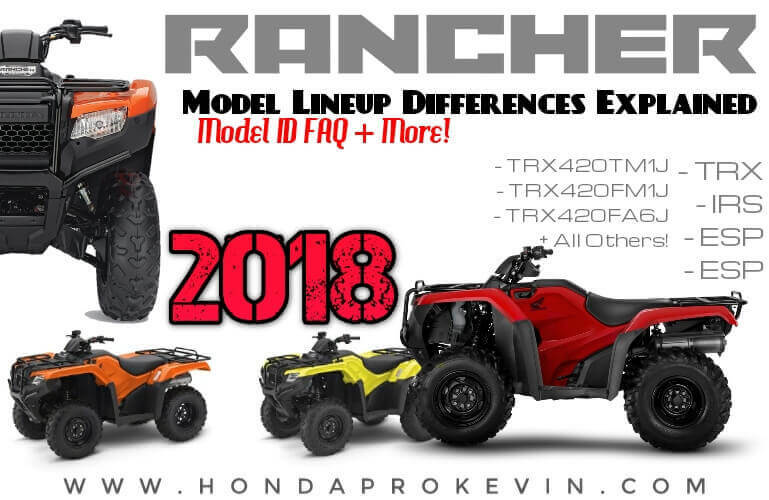 UPDATE 4/8: 2018 Honda ATV Model Lineup Announcement – CLICK HERE! 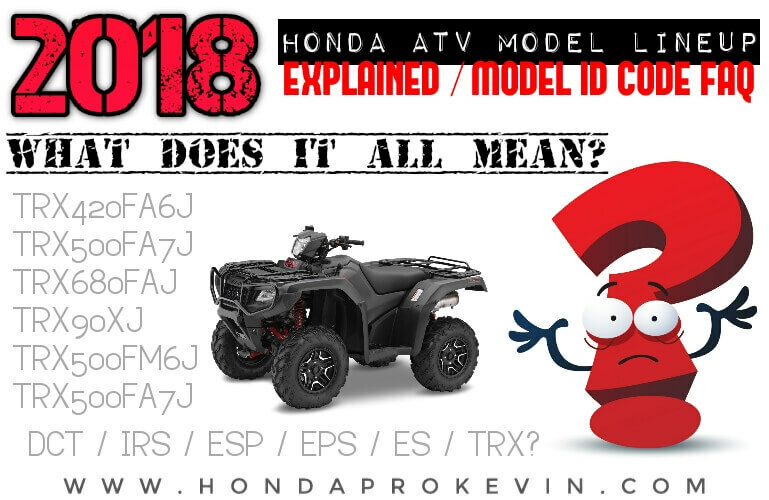 Now we’ll get to a breakdown of each of the 2018 Honda ATV models covering their release dates, new color options etc. At this time, pricing hasn’t been released. I will be updating this page within the next couple of weeks with pricing for each of the 2018 ATV models listed below as well as more pictures. Recognizing the importance of easy maneuverability for some users, engineers gave this model a small footprint and a light overall weight, resulting in agile, nimble handling. The model’s light weight and small footprint make it easy to maneuver through tight situations, and the longitudinal, 250-class engine still has plenty of power and torque for getting the job done or making it through challenging terrain. Electric start and Rincon-like styling are both standard. As is the case with their larger models, Honda offers Recon customers options when it comes to transmission, with a manual, foot-shift gearbox and electric, push-button ES shifting both available. The 2018 Recon 250 returns with a new color option of Vapor White as well as Olive Green. In an age of increasing specialization, versatility can be extremely refreshing, and it’s difficult to find a better example of do-it-all effectiveness than Honda’s family of capable Rancher ATVs. With incredible versatility and value, the Rancher has been a strong performer since its 2000 introduction, helping it to become Honda’s best-selling ATV in Honda’s history. No matter what the application—whether it’s accessing a favorite deer stand, repairing a fence on the back 40, or just exploring the local OHV area with friends—there’s a Rancher that’s ideally suited. The current version is the best ever, enabling customers to choose between (6) difference model configurations: Independent Rear Suspension (IRS) or swingarm, Automatic Dual Clutch Transmission (DCT) or standard gearbox, Electric Power Steering (EPS) and standard, and 4×4 or two-wheel drive. No matter what the options, Ranchers are renowned for their durability, and they’re equally capable at the jobsite and on the trail. The 420cc liquid-cooled single-cylinder engine offers the sort of unrivaled reliability that keeps Rancher owners using their vehicles for many years, and appropriately, the spread of power is well suited for any situation. For the 2018 Rancher 420, two new colors have been added: Vapor White & Active Yellow. The TRX500 Foreman makes its return for 2018 with some new color options. Honda also discontinued a few Foreman 500 models last year to simply your options when searching for the perfect Foreman to fit your needs. This year Honda did keep the model lineup the same and didn’t discontinue any other model variations of the Foreman. An unapologetic workaholic, Honda’s Foreman 4×4 craves long hours of faithful toiling, and as both variations of this durable ATV are equipped with swingarm rear suspension and an enclosed axle, they’re more than up to the task. Now available in Shale Blue, the reliable Foreman has a locking front differential and is powered by a fuel-injected 500-class engine, and it’s available with either a foot-shift manual transmission or push-button electric shifting and with or without power steering (EPS). Bearing in mind all this and more, the Foreman 4×4 is prepared to put in long hours, and the standard handlebar-mounted assist light can be turned on when the sun goes down for even greater trail illumination. The TRX500 Rubicon makes its return for 2018 with some new color options this year. Honda also discontinued a few Rubicon 500 models last year to simply your options when searching for the perfect Rubicon to fit your needs. The four-member, 500-class family of premium Foreman Rubicons is packed with powersports-category exclusives. For example, the Rubicon 4×4 EPS is the only ATV offered with a combination of a tough manual-shift transmission and independent rear suspension, and for those who’d rather not do all the shifting themselves, the other three variations come with Honda’s revolutionary DCT gearbox, a durable geared system that has dual ranges and can execute shifts seamlessly. The IRS contributes to an impressively comfortable ride, even when spending long days in the saddle, along with excellent handling over the roughest terrain. The long list of available features includes Electric Power Steering (EPS), and all models can be switched between three drivetrain settings: 2WD, 4WD and 4WD with differential lock. 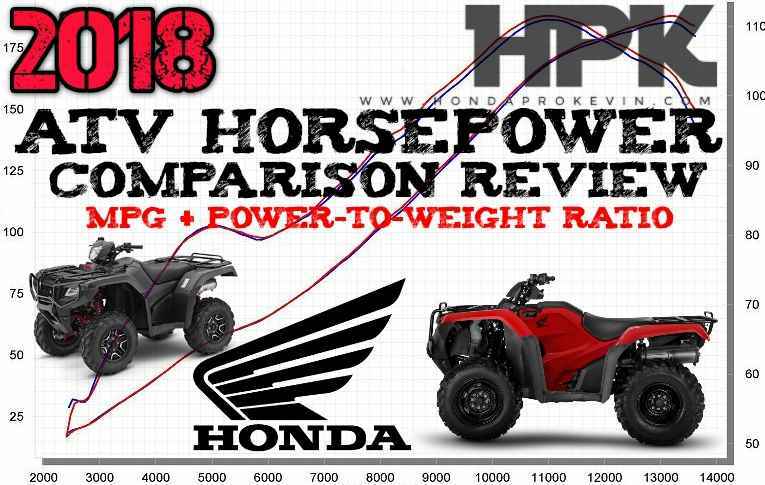 I was kinda hoping to introduce a 2018 Rincon 1000 DCT / EPS ATV with this 2018 ATV model lineup announcement from Honda but this go-around Honda is keeping the tried-and-true and proven Rincon 680 around for another year. 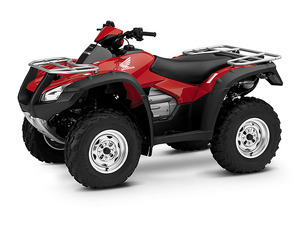 For customers who prefer larger ATVs, the Rincon is the biggest model in Honda’s lineup, with a powerful 675cc liquid-cooled, fuel-injected four-stroke engine and premium long-travel suspension, giving it unmatched comfort and ride quality. Not only does the refined Rincon boast Honda’s biggest ATV engine (a liquid-cooled 675cc single with a twin-plug cylinder head), it makes more efficient use of that power plant by mounting it longitudinally in the chassis, so that the crankshaft is aligned with the vehicle’s direction of travel. This achieves a number of benefits, including a more direct link to the rear axle. 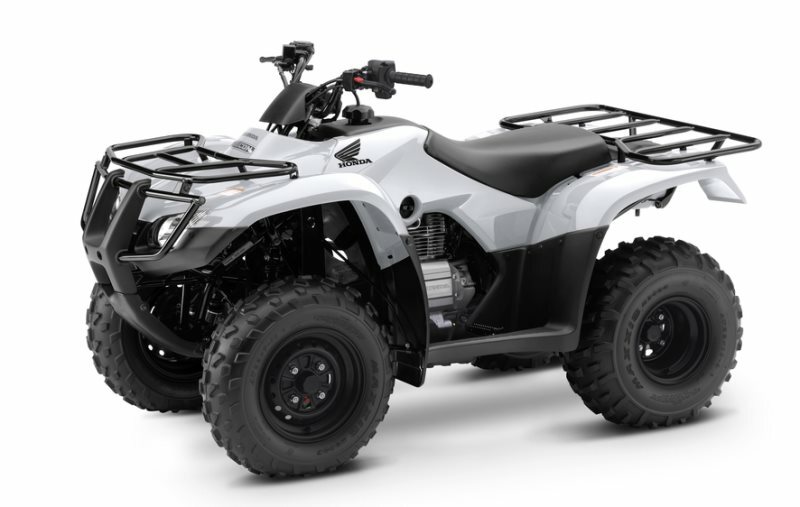 The Rincon is a premium model, with independent rear suspension and an automotive-style, belt-less three-speed automatic transmission that can be shifted manually if you choose to do so, proving that a luxurious user experience is possible even in the rough world of ATVs. For 2018, the Rincon has (2) color options: Red and Honda Phantom Camo. The 2018 Honda TRX90X returns unchanged for 2018. Without a doubt, Honda’s proven TRX90X is one of the best first steps that a young rider can take on the journey toward a lifetime of off-road recreation. This air-cooled four-stroke has all the right ingredients to be the ultimate first machine: electric starting, manageable power, consistent handling, compliant suspension, and uncomplicated controls. The TRX90X used to be recommended for kids 12 and older but that age has now been dropped to being recommended for kids 10 and up. Introduced in 1987, the TRX250X remains a big hit with sport riders, who appreciate its wide powerband, high fun factor and legendary Honda reliability. New riders love Honda’s exclusive SportClutch™, which allows them to learn clutch control without having to worry about stalling. 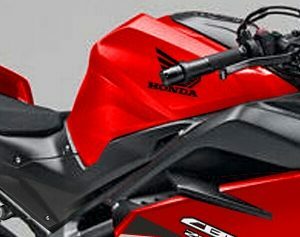 At the same time, long-travel suspension mean the TRX250X is appropriate for advanced riders as well. For 2018, the TRX250X is now available in a new Active Yellow color as well as Red. Honda’s TRX250X has rightfully earned its reputation as the most approachable sport ATV on the market. Merging tried-and-true off-road capabilities with commonsense Honda technology, the TRX250X is sporty, fun, reliable, and user-friendly, all while remaining remarkably affordable.